Arthur James Wetherall Burgess (1879-1957). Oil on board, signed. Provenance: Theobald Studios, Queen's Terrace, London; Royal Exchange Art Gallery, London; Christie's, London, Lot 244, 24 November 2011. The "BRITANNIA" in the painting's title is referring, of course, to King Edward VII's racing yacht - arguably the most famous racing cutter of them all - who was based with the Royal Yacht Squadron at Cowes in the Isle of Wight. Her "playground" for most of her career was those waters off Cowes and in the Solent which this painting depicts together with His Majesty's [steam] Yacht VICTORIA & ALBERT over to the left, stern to us. She was always to be found lying to a buoy off the RYS during Cowes Week supporting the King and enabling him to entertain as he wished without burdening the Squadron, and to be his floating palace and home complete with the necessary members of his Household and secretariat. Arthur Burgess has shown the Royal Yacht wearing the French tricolour at the fore and in the background, to the left of the V&A, we see the unmistakable shape of the French battleship MASSENA who was there leading a French naval squadron, for the Entente Cordiale was in the making and the Cowes Regatta in those days had a certain political and diplomatic cachet. The rich of all Europe converged on it and their leading politicians too: King Edward's presence aboard his magnificent steam yacht was an additional and powerful draw. As HRH The Prince of Wales, Edward had commissioned the sailing yacht designer G L Watson in 1892 to design him a racing cutter. Built at Henderson’s yard on the River Clyde she had an overall length of 122 feet 6 inches and bore the proud name BRITANNIA: when first commissioned she sported over 10,000 square feet of canvas (supplied throughout her lifetime and in varying rigs by Ratsey & Lapthorne) and was designed to be sailed by a crew of 30 plus the captain and sailing master. At her masthead she flew the racing colours of her owner, Winsor (sic) blue diagnalled with Alazarin crimson, the whole defaced with the Fleurs de Lys, the Prince of Wales’ feathers’. She won her first race in May 1893 with, we are told, a wildly enthusiastic and excited Prince of Wales onboard, and out of 38 starts that season she won 20 times. The beautiful BRITANNIA with her lovely lines and the glamour that attached to her owner and his habit of winning time and again had a discernible effect, we read, on the fortunes of large cutter racing in Great Britain which hitherto had been in decline; and across the North Sea in Germany the interest of the Kaiser, too, had been alerted. Four years after BRITANNIA had been ordered, the Kaiser commissioned METEOR, a foot longer than her British rival and carrying yet more canvas! Certainly in England the pastime received an immediate boost which endures to this day with the Royal Yacht Squadron remaining at the heart of the world’s serious sailing activities. 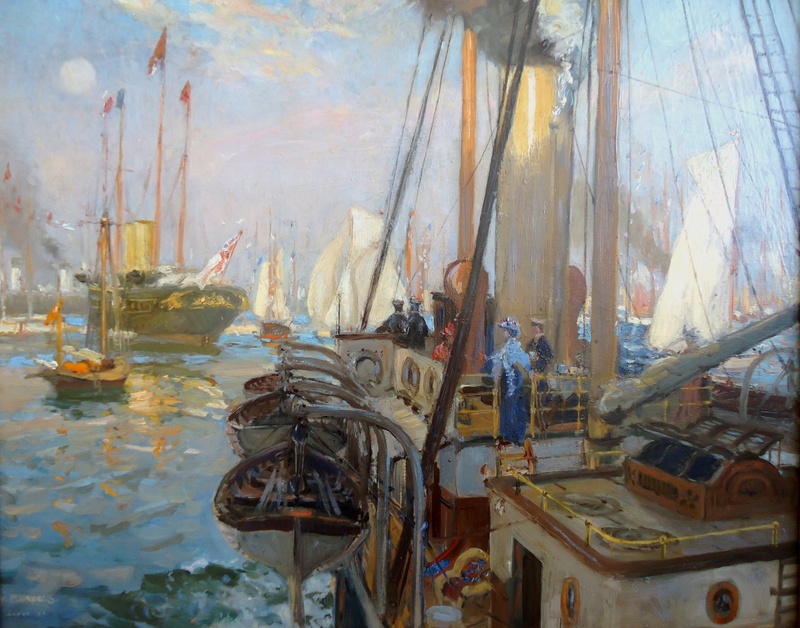 This oil shows us something of the graciousness and style, the flamboyance, the extravagence and the sheer numbers of craft of every sort that were afloat and that were always at the heart of these Edwardian Cowes Weeks. Gorgeous steam yachts with their highly polished fittings and elegantly dressed passengers lounging casually on scrubbed white wooden decks; large racing yachts, their impeccably turned out crews, competitive to a man and highly drilled and competent in the art of handling acres of billowing canvas, often in extremely testing conditions of wind and sea; and riding amidst them all the royal yachts - always a British one or two sporting huge and pristine white ensigns of the Royal Navy - and quite often a visiting royal yacht or two from abroad, all with gleamingly shiny sides and upperworks and sporting fluttering Standards denoting the nationality and seniority of the Royal persons embarked - all were attracted by what was the internationally unique Cowes Regatta and Burgess has captured it here superbly. BRITANNIA’s history was to be chequered: sold out of ownership by the Prince of Wales in 1897 she re-hoisted his racing colours again in 1902, though by now her owner had become His Majesty King Edward VII. But HM had lost none of his enthusiasm for his yacht or the sport and wearing a Royal Yacht Squadron boating jacket, a panama and smoking a cigar, he would perch on a wicker chair by the doghouse, every detail of the racing absorbing his interest as he watched the crew about their business. Laid up in the Great War in her mud berth on the Medina in the Isle of Wight it was not until late 1919 that King George V (who had succeeded his brother in 1910) gave orders for her to be re-fitted in readiness for the 1920 racing season. Her mast was heightened, her sail plan altered - all to beneficial effect - and for those Cowes Week seasons of the 20s and early 30s His Majesty, BRITANNIA and the steam Royal Yacht VICTORIA & ALBERT were invariably to be found off the Castle, headquarters of the Royal Yacht Squadron. HM raced by day, freshened up in his electric bath aboard the VICTORIA & ALBERT afterwards and then was often to be seen in his Squadron mess kit being run in to the Castle for dinner by the Royal Barge. Several hours later the barge would return to the Squadron steps (”Suicide steps” the Royal Barge Officers in V&A - and a generation later, in BRITANNIA - called them as there was often the devil of a swift tide running across them!) to collect the King and his party and run them back out to the V& A for the night. And then it was racing again the next morning: hopefully it would be a strong blow and a lively sea in which BRITANNIA revelled and always excelled and which became known by her many well-wishers and admirers as “Britannia’s Weather”. BRITANNIA’s rig was altered again for the 1928 season and then she was converted to the J Class Bermuda rig for the 1931 season: it wasn’t a huge success, her performance to windward, we are told, never again being quite the same. In 1935 the King died and after BRITANNIA had been offered to King Edward VIII and the Dukes of York and Gloucester, all of whom declined, it was the late King’s wish that his yacht be scuttled - but only by his beloved Royal Navy: he couldn’t bear the thought that she wouldn’t be cherished and lovingly cared for and raced. Her wheel  at which a smiling King had so often been photographed by Beken and others - was removed; her 175 foot mast unshipped and sent to BRNC Dartmouth to adorn the parade ground approach to the College, her boom to Carisbrooke Castle on the Isle of Wight: the remainder of her fittings were auctioned, the sum of over a £1000 being sent to King George’s Fund for Sailors. Early in the morning of 10th July 1936 whilst it was still dark, and with a heavy heart, two destroyers of the Royal Navy towed her out to sea and scuttled her in deep water south of the Isle of Wight. A garland of wild flowers had been placed around her bows. Her wheel was subsequently fitted in the wheelhouse of the new steam Royal Yacht BRITANNIA when she was built in the early 1950s and steered her for over a million miles in the 44 years of her seagoing career around the world. The wheelhouse – complete with the old sailing BRITANNIA’s wheel – is part of the display to be seen at Leith where the steam yacht BRITANNIA is now preserved. And those famous old racing colours which fluttered so proudly from the racing yacht? In 1993 – the centenary of her debut – the Commander of the Royal Yacht BRITANNIA whilst on Royal Duty at Cowes Week commissioned a tie - the 'Britannia tie'- composed of the old racing yacht's colours, to commemorate this beautiful sailing craft and to ensure her memory endures. And one of her burgees, much faded and worn, hangs proudly on the walls of the Royal Yacht Squadron where BRITANNIA had so thrilled its members over the decades.